Arthur Schopenhauer was the son of a merchant from Danzig. His mother Johanna was friendly with Goethe and became an author herself. She roused literary interests in him. Since the family often travelled in Europe, he learned to appreciate French and English culture. According to his father's wishes he set out for a commercial career. His father died in 1805 (probably suicide). The family moved to Weimar and after a while his mother conceeded to his wishes to enter the University of Göttingen (1809). Arthur and his mother didn't get on well and their relations were strained during the rest of their lives. Furthermore, he didn't like her spending his father's money and her seeing other men. This was probably a major cause for his dim view of women. He considered them childish and thought they had no genius (his mother had become a popular writer by then). In 1811 he continued his studies at the new University of Berlin. He considered his understanding of philosophy far better than that of his teachers. In 1813 he became a doctor at the University of Jena. He returned to Weimar where he spend four years writing his main work, "Die Welt Als Wille Und Vorstellung" ("The World as Will and Idea"). It was published in December 1818 and went largely unnoticed. Schopenhauer was a pessimist who believed that people had no individual will but were part of a universal will that caused universal suffering. He took a vacation in Italy, carrying a letter of introduction to Lord Byron that Goethe had given him. But when he saw how delighted his female companion was when they saw Byron on horseback in Venice he decided not to meet him. After his return to Germany he accepted a teaching post at the University of Berlin. There he scheduled his class at the same time as Hegel's in 1820. Hegel had inherited Fichte's chair and his lectures were very popular. Hardly any students attended Schopenhauer's class. He quit and would never return to teaching. In 1831 he settled in Frankfurt am Main. When he received a price from the Danish Academy in 1838 he expected that interest in his work would rise, but again nothing happened. But after a second edition of his main work was published he slowly started to attract attention in Europe. In 1851 his "Parerga and Paralipomena" finally brought him the fame that he had longed for. He died in Frankfurt in 1860. In 1873 the first complete edition of his work was published in six volumes. 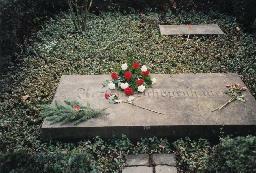 The grave of Arthur Schopenhauer at the Hauptfriedhof, Frankfurt.